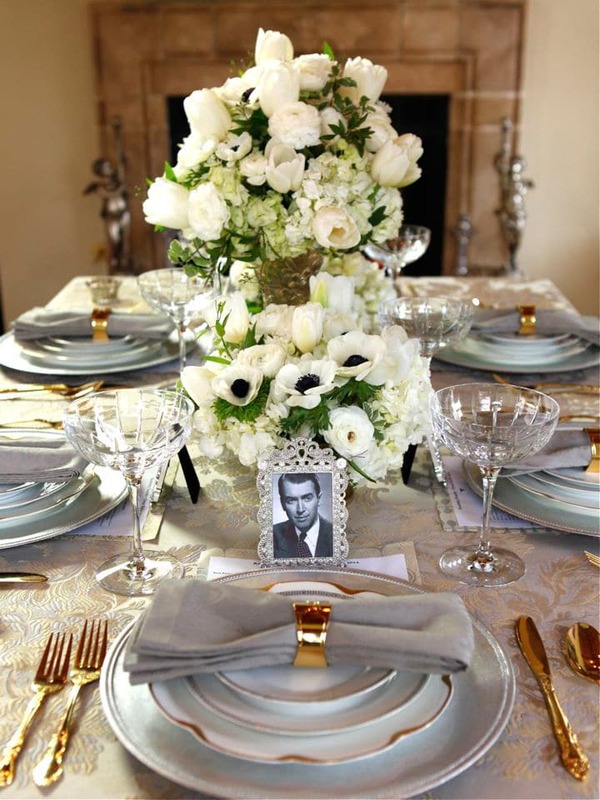 Tablescape designed with help from my friends at Dish Wish and Bride and Bloom Flowers. 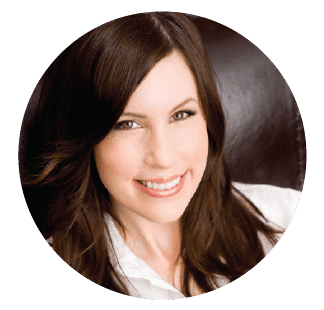 Be sure to check out their fabulous websites for more inspiration! When it comes to decorating, pretty much everything I do is inspired by the past. 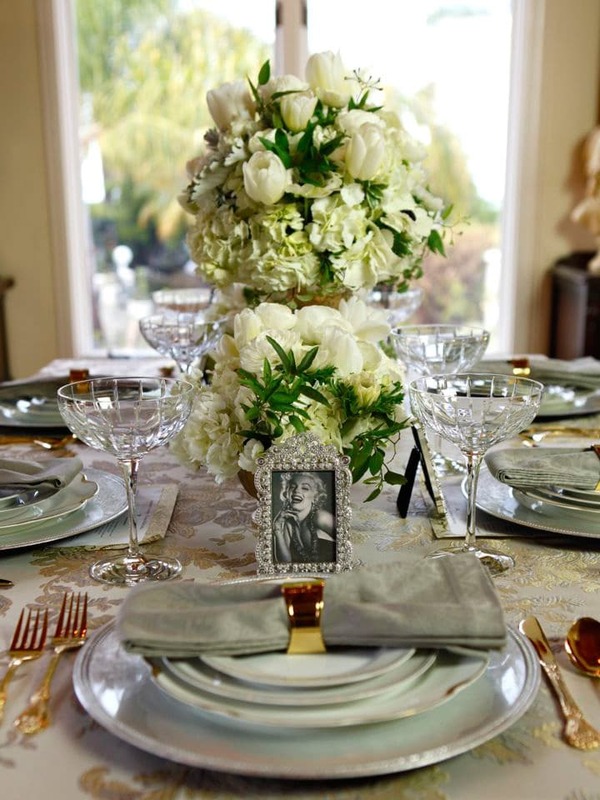 I love adorning my tablescapes with vintage dishes, linens, vases, and romantic touches from days gone by. With the Oscars around the corner, I thought it would be fun to create a cinematic party tablescape inspired by the Golden Age of Hollywood. I live in the Hollywood Hills of Los Angeles… in fact, a short walk from my house there is a terrific view of the Hollywood sign. Sometimes I take it for granted, living in the middle of so much film history. 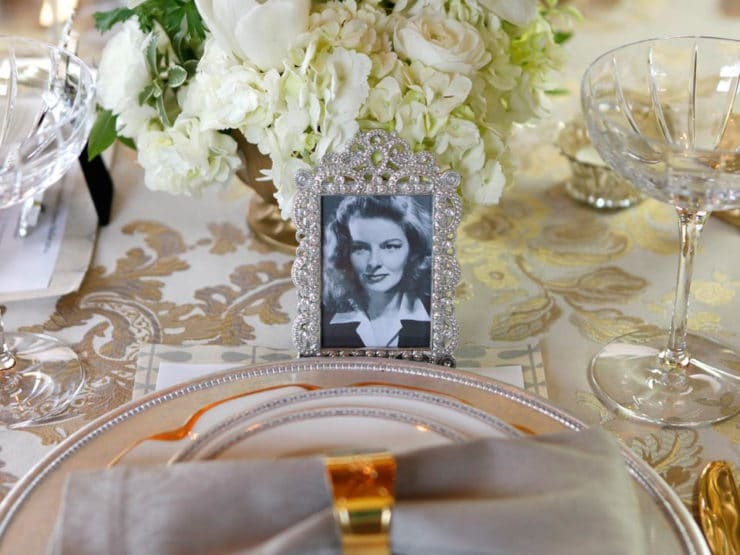 Putting together this table was a fun way to reconnect with our local nostalgia and honor the legendary icons of Hollywood’s silver screen. Throwing your own Oscar Awards bash? Scroll to the bottom of the post, where I’ve posted a pretty printable PDF Oscar ballot to share with your guests! I used my great grandma’s vintage plates as the main inspiration for this table– they’re the smaller plates above with black Egyptian-looking borders and a very thin gold line around the edge. 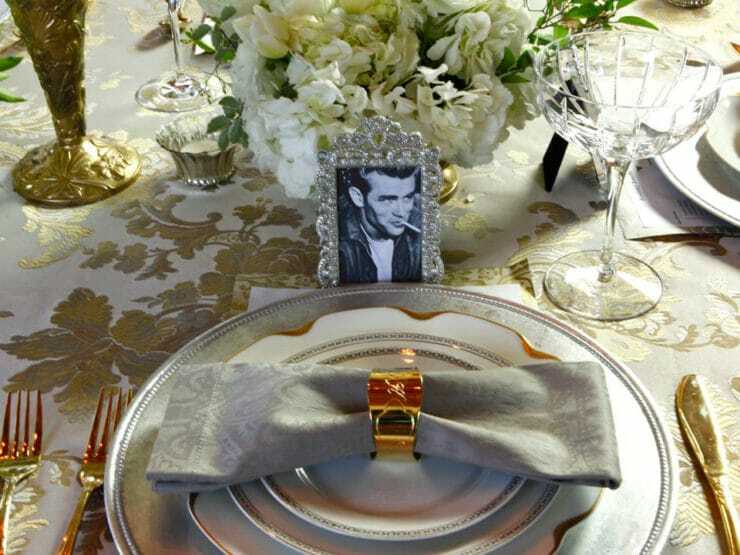 I knew I wanted gold as part of this table– it’s an opulent color, reflective of Hollywood’s golden past. Even Oscar himself is gold. My friend Laura at Dish Wish lent me some beautiful gold-rimmed dinner plates with scalloped edges, some flashy gold utensils and a set of gold napkin rings. 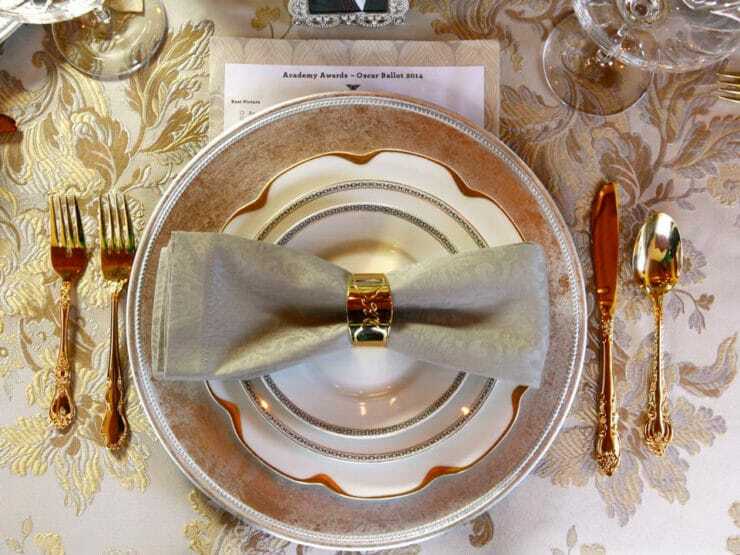 While this all might have seemed like a bit “too much” gold, I found that layering the plates on top of a muted silver charger and using a silvery-gray napkin brought it all together beautifully. This way the gold provided a lovely accent without overwhelming the table. 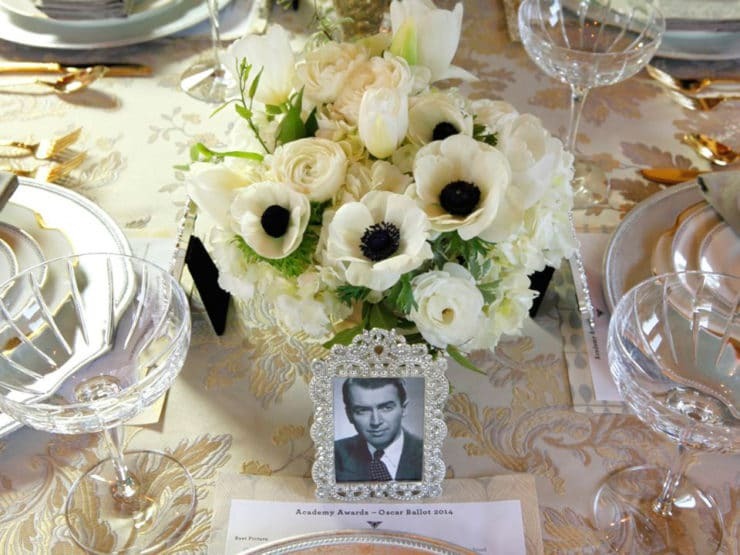 A silver and gold tapestry-style tablecloth provided the perfect backdrop. Marilyn Monroe was seated at the head of the table. Her smile lights up the whole room, even from a small black-and-white portrait. I placed Jimmy Stewart at the opposite head of the table, a fitting place for him I think. Wasn’t he dreamy? How pretty are these flowers from Amy at Bride and Bloom floral? I asked her to play on a white and gold motif. She came back with these gorgeous arrangements– they’re modern yet classic, and the green foliage freshened things up and balanced out the vintage elements at the table. I think Charlie Chaplin and Dorothy Dandridge are impressed! 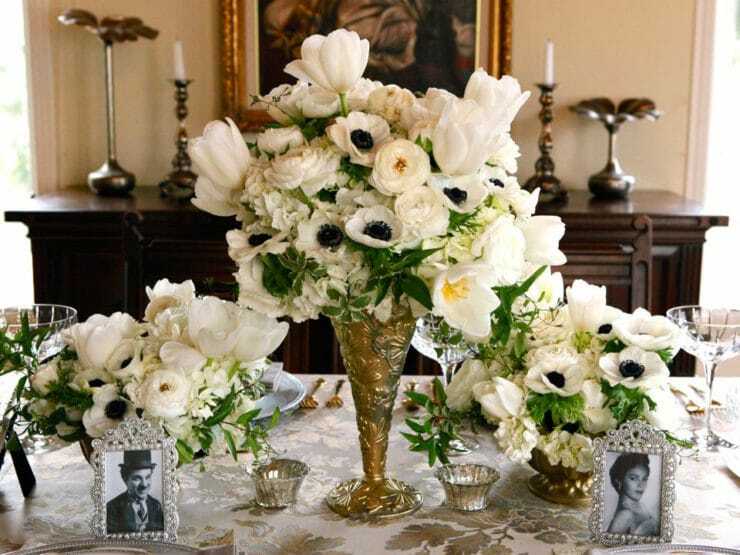 I especially love the white poppies with black centers, very dramatic. Lovely, aren’t they? And James Dean. I asked him not to smoke at the table. He ignored me. I created a pretty Oscar ballot (linked below). For a little extra flair, I printed the ballots, trimmed the edges and matted each page onto decorative linen paper using a thin layer of Modge Podge. 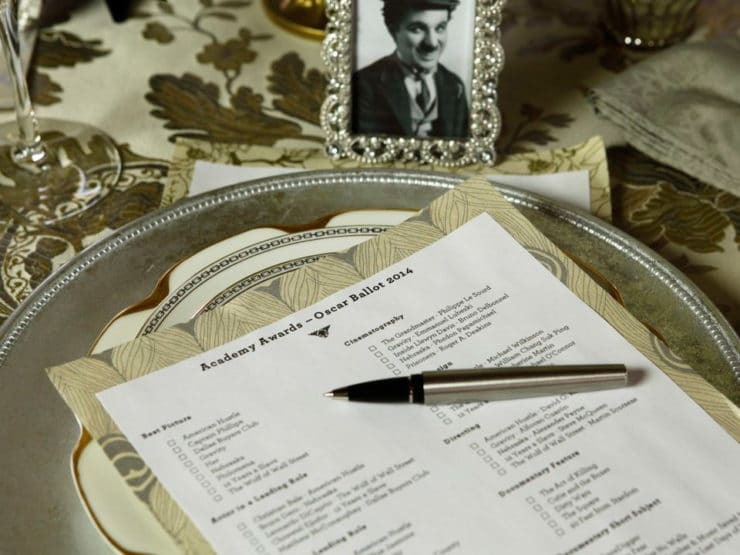 One ballot was placed at each place setting so all of the guests can wager on who the winners will be. Crystal coupe glasses (champagne saucers) were the perfect final touch– so elegant, the perfect way to toast with bubbly. 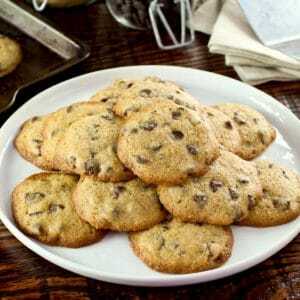 These are from Williams-Sonoma, but you can also find good deals on vintage sets at flea markets, on Etsy and eBay. 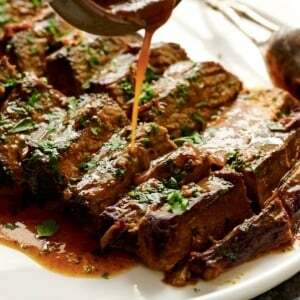 Ready to host your own Oscars bash? 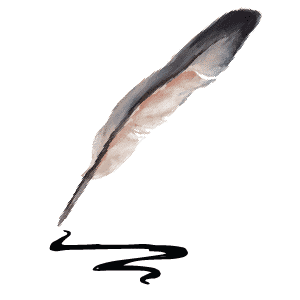 Click below to print out a lovely Oscar ballot for this year’s awards ceremony! Are you planning on watching the Oscars this year? Who are your favorite Golden Age movie stars? DeeAnna Rae May looks like your wedding! A golden age of Hollywood party! for my moms 90th Birthday next year! I am sure it will bring back great memories of living in Hollywood in 1950 and given movie premiere tickets to “King Solomon ‘s Mines” by the star, Stewart Granger personally! Fantastic idea Tori! Any more? Millie that is so neat!! I hope your mom has a blast at her birthday party. 🙂 I am working on expanding this section with more ideas, stay tuned! Katherine Hepburn, the Barrymores, Bette Davis, Jimmy Stewart, Shirley Temple!!!!! Both Hepburns, Cary Grant, Lauren V+Bacall, Humphrey Bogart, Bette Davis, Carole Lombard, Fred Astaire, Cyd Charisse, . . . . . . .
Cary Grant and Katherine Hepburn. 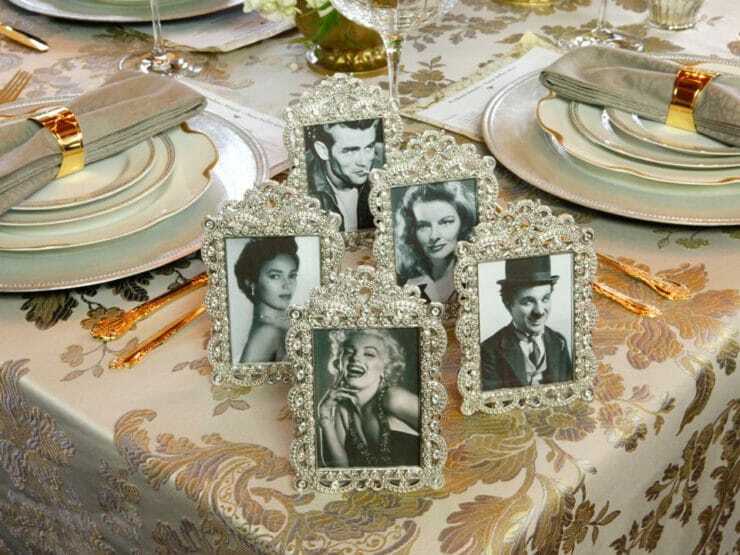 James Cagney, Humphrey Bogart, Olivia DeHavlin, and of course the king Clark Gable! Oh I forgot Lauren Bacall! Vanessa Redgrave and “Honorary Academy Award winner Eli Wallach. Very classy and elegant table. Katharine Hepburn, Cary Grant, Humphrey Bogart, Spencer Tracy. Beautiful! And what is on the menu? So pretty!! I love Marilyn Monroe, so glad you featured her! 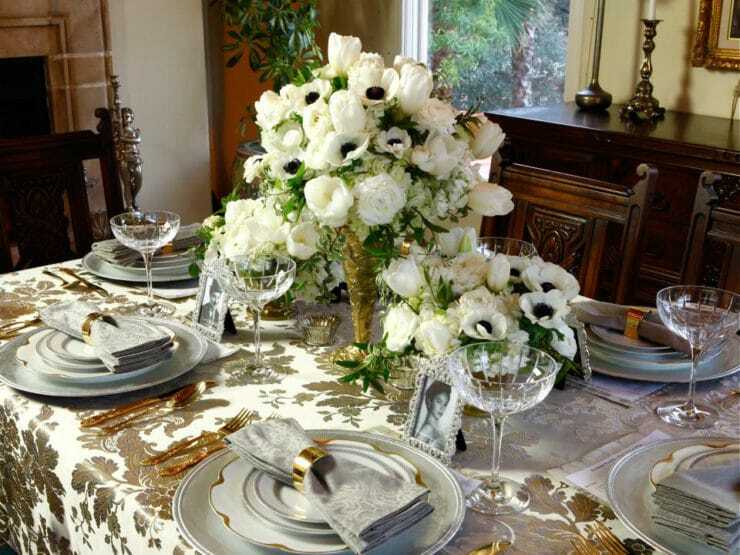 i don’t care for hollywood, but the tablescape is beautiful!